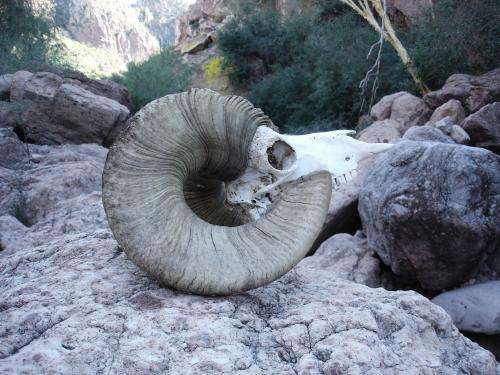 This photo shows a bighorn sheep skull from Tiburón Island. Credit: Benjamin Wilder, UC Riverside. Using ancient DNA analysis and other techniques, a research team led by conservation biologists at the University of California, Riverside has determined that bighorn sheep, so named for their massive spiral horns, became extinct on Tiburón Island, a large and mostly uninhabited island just off Sonora, Mexico, in the Gulf of California, sometime in the last millennium—specifically between the 6th and 19th centuries. The result, published March 19 in PLOS ONE, is a surprise because conventional wisdom among wildlife biologists and the indigenous Seri people who long inhabited this coastal desert region was that bighorn sheep had not occupied Tiburón Island before 1975, when sixteen female and four male bighorn sheep were deliberately introduced. This introduction—viewed until now as an introduction of an alien species into a previously unoccupied ecosystem—was aimed at fostering a large, breeding population at a safe site that could be used in restocking the mainland, where historic land use decimated native bighorn sheep populations. "Introduction success was expected on Tiburón Island, given the suitable habitat, lack of predators, absence of domestic sheep and their diseases, and minimal human disturbance," said Benjamin Wilder, a Ph.D. graduate student in UC Riverside's Department of Botany and Plant Sciences and the lead author of the study. "Indeed, by the mid-1990s, the Tiburón herd had grown to a stable population of 500 animals, one of the most successful large mammal introductions in the world." The research got its start when in the spring of 2012 Wilder, along with a lab mate and his Seri collaborators, made an incidental discovery of a 1500-1600-year-old, urine-cemented dung mat on the floor of a small cave in the Sierra Kunkaak, a rugged mountain range of the eastern side of Tiburón Island. Subsequently, Jim Mead, a paleontologist at East Tennessee State University and a coauthor on the study, used his extensive dung collection of both living and extinct herbivores to determine that bighorn sheep formed the dung mat. Benjamin Wilder noting specifics of the bighorn sheep deposit on Tiburón Island. Credit: Andrew Semotiuk. This determination was later confirmed by conservation geneticists at Oregon State University, who used specialized techniques to extract and sequence mitochondrial DNA from the ancient sheep pellets. The ancient sequences differed substantially from other large herbivores that might have been present. Further, the DNA sequences were not identical to the modern bighorn populations on Tiburón Island, giving confidence to the researchers' claim that the sequences do not derive from modern use of the cave by introduced bighorn sheep. The discovery raises fascinating questions: How should the reintroduction of bighorn sheep on Tiburón Island be regarded? Is it a restoration or a biological invasion? The latter question also applies to most cases of rewilding and de-extinction efforts. 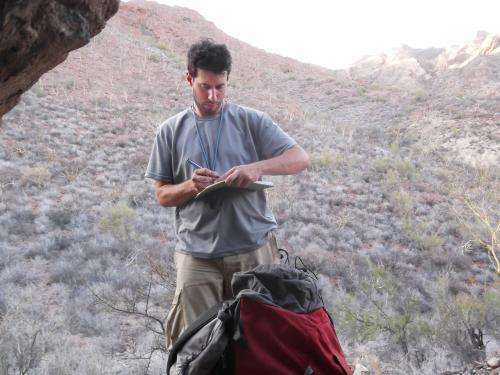 Julio Betancourt, a USGS paleoecologist and co-author on the study, thinks that, in the future, "molecular caving, the application of molecular genetics to cave sediments, will become more than an afterthought to answer such questions in aridland paleoecology and conservation." Wilder agrees. "With extended biological baselines, such as the knowledge that the Tiburón bighorn sheep went extinct before, it is possible to refine conservation targets," he said. "Given the cultural and conservation significance of the Tiburón bighorn, actions can be taken to avoid their past fate." Wilder, Betancourt, and Mead were joined in the study by Clinton W. Epps and Rachel S. Crowhurst at Oregon State University; and Exequiel Ezcurra at UCR. Wilder works in Ezcurra's lab.